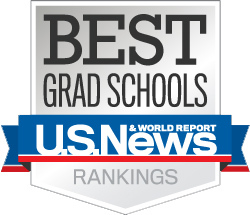 According to the 2016 U.S. News and World Report rankings of graduate programs, GW's Trachtenberg School of Public Policy & Public Administration is now the highest ranked public affairs school in D.C., Maryland and Virginia. In this ranking of overall school and programs of public policy and public administration, the Trachtenberg School is tied for 13th with a score of 3.8 out of 5. "Our faculty's outstanding scholarship and our school's long track record and continuing strength in developing leaders through classwork and hands-on experience while students are in the program and as alumni has earned us this distinction," said Dr. Kathryn Newcomer, director of the Trachtenberg School. The Trachtenberg School was also ranked in four specialty areas in the 2016 rankings. The school is tied for 11th in the field of Public Management Administration. For schools teaching Health Policy and Management and in the field of Public Policy Analysis, the Trachtenberg School is ranked 14th. In the field of Social Policy, the Trachtenberg School is tied for 20th." "These rankings make me confident I'm enrolled in a distinguished program recognized by other institutions and people in the field for its ability to prepare students for public service," said Rachel Schwartz, MPA '17.